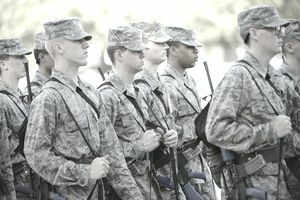 Some people go into military basic training in survival mode and have a tough time meeting the standards every day, while others embrace the training as a team player and leader among their peers. How do you do this? Prepare yourself physically, and the mind will follow. Learn how to be a good team player while in high school/college whether that is sports, band, or club activities. These are some of the valuable skills you can start learning now that will benefit you during your military journey. Regardless of what your recruiter told you, being a member of the United States Armed Forces is not just like having a civilian job. In the military, there will always be someone telling you what to do, when to do it, and how to do it -- and you've got to do it. Sometimes they'll tell you to do something that you don't want to do, or tell you in a way that makes you angry. Failing to do it is not an option. The willful disobeying of a lawful order won't just get you "fired," as it would in a civilian occupation, it can get you sent to jail. In the military, you'll work the hours you are told to work, you'll work "overtime" with no additional pay, you'll do the tasks you're assigned to do (even if they don't relate exactly with your "job"), you'll live where you're told to live, and you'll deploy where and when you're told to deploy. If you're not absolutely willing to make these sacrifices, then do yourself and the government a big favor and don't join. Military boot camp is like nothing you've ever experienced. However, the rigid routine and absolute control over every aspect of your life are several times worse than normal military duty, and that's by design. They do this by applying significant degrees of physical and mental stress, while at the same time teaching you the fundamentals of military rules; and the policies, etiquette, and customs of your particular military service. The training programs are scientifically and psychologically designed to disassemble the "civilian" and build from scratch a proud, physically fit, and dedicated member of the military. You'll find that boot camp gets just a little bit easier each day. You may also find in the future that your military service was a major part of developing who you are, no matter the length of service. While it will help to get into shape and prepare yourself mentally before enlisting, you still may not be fully braced for all the military will throw at you during boot camp. How well you deal with unexpected challenges is just one more way the armed services separate the soldiers, sailors, airmen and Marines from those who aren't suited to serve.